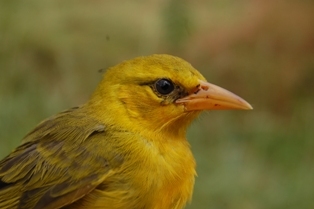 The Spectacled Weaver Ploceus ocularis is named after the black line running through its eye. It is found in open woodland, forest margins, bushy thickets, wooded valleys, along riverine woodland, savanna with sparse trees, and gardens. Unlike many other weaver species, Spectacled Weavers have the same bright yellow plumage year round. Sexes are similar but the female lacks the black bib of the male (above left). The juvenile has a pinkish bill, without the eye-stripe initially but can be distinguished from other weavers by its thin bill (above right). See a photo of the female in this pdf on eye colours here (821 kB). The western race of the Black-necked Weaver Ploceus nigricollis (see photo birdpix 1064) is very similar in plumage, and the two species overlap in range in Cameroon. 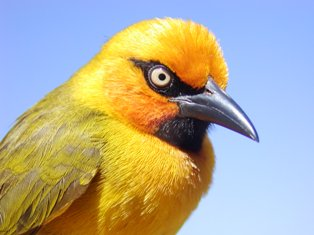 The Spectacled Weaver is minly insectivorous, including crickets, moth caterpillars, beetle larvae; also spiders, centipedes, small crabs; geckos 3 cm long; berries; whole flowers; nectar. The typical call while feeding is a characteristic descending series of whistles,'tee-tee-tee-tee". Photo (left): pair of Spectacled Weavers at nest suspended from roof, a rather unusal nest site for this species, from phown 2303. It is a solitary species, probably a permanent pair bond, and pairs often nest at the same site every year. Sometimes nests from previous seasons hang near new nests. The nest is usually built by the male but sometimes the female helps. Unlike polygynous weavers which often build a nest in a day or two, the Spectacled Weaver may take 2-3 weeks to complete its nest. The entrance tunnel is usually 10-20 cm long but may be more than 60 cm long. Nest height varies from 1-7 m above the ground. Egg laying may be as long as two months after the nest is completed. Sometimes a pair will raise two broods in a season - the same nest or a new nest may be used. Beryl Fraser submitted a great sequence of photos of a Spectacled Weaver pair that raised two broods in the same nest - see the PHOWN record here. It is an occasional host of the Diederik Cuckoo Chrysococcyx caprius. 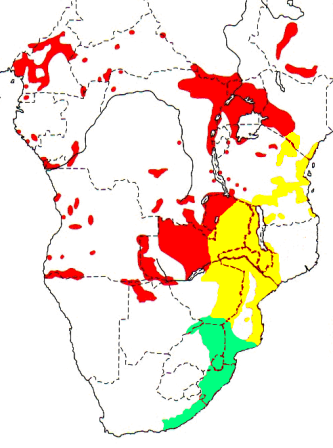 The oldest Spectacled Weaver to date was a female recaptured several times up to 12 years 7.5 months later (see here). There are 62 PHOWN records (see PHOWN summary), but more PHOWN records are needed. By taking photos from the side of the nest and submitting to PHOWN, it may be possible to estimate the length of the tunnel from the photo. This way a large sample of tunnel lengths may be obtained, so please do look out for Spectacled Weaver nests! Pairs may remain near their nests during winter, so it is also worthwhile checking to see if the birds roost in their old nests during winter (if you are fortunate enough to have them breeding in your garden!). Submit any weaver nest records to PHOWN (PHOtos of Weaver Nests) via the Virtual Museum upload site.